Matt Green agreed that being dropped to the bench for the last four games had sparked him back into life and had no complaints over boss Adam Murray’s decision. 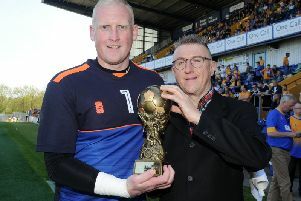 Green was the hero of Mansfield Town’s 3-1 League Two home derby win over Notts County yesterday. Click HERE to read boss Adam Murray’s thoughts. For the second time in a week he came off the bench to be a matchwinner, this time scoring within seconds with his first touch and then tucked away an ice cool stoppage time penalty to win it. “It was no surprise to be on the bench again,” he said. “The manager knows how to get the best out of me. “There had been a lot of controversy the last few weeks before that, so he took me out of it. We have a good enough team as we have seen today. “We have strength in depth. He is the boss. He is a talented young manager and if he is making me come on and score two goals he is doing something right. “You never don’t want to play. I never want to be taken out of teams. “But that is a decision the gaffer made and his experience has paid off. “He made the decision and I got behind the group as did (Darius) Henderson, CJ (Hamilton) and all the other lads on the bench. Green’s drop-off in form came during a spell of rumours during the transfer window that he was to be sold. He agreed the talk and bids from other clubs did have an affect. “I am no different to any other person,” he said. “I have family and my football is what I do for a living. “So you want to make sure you make the right decisions and stay on the right path. “I was never going to leave to go to Leyton Orient, I wouldn’t go to another League Two club. “There were other clubs involved but it’s been put to bed now. “The chairman has looked after me and the club have shown their support. The gaffer has shown terrific belief in me and the team’s got behind me, so it’s done. “There was mention of a new contract and I think is in the process of happening. All I’ve got to do is keep scoring goals on the football pitch. “The best players in the world miss chances and sometimes go games without scoring goals, so it’s just about patience and working hard. “That’s all I’ve been doing behind the scenes and I will continue to do that no matter what. Green came onto the pitch to a huge cheer yesterday and immediately produced the goods. “The manager just said if you get any sniffs round the box or any chances, take them,” said Green. “The front two were outstanding and wore the defence down. The pressure on Green was immense when he stepped up to take the penalty in stoppage time with the derby poised at 1-1. But he said: “I have quite a cool head on me most of the time. “I knew there was a lot of pressure on it, but I will still frustrated after missing one earlier on in the season. So I knew I had to take this chance.